Battambang is a quiet town, but there’s more than enough sightseeing and things to do to keep you busy, from visiting the local temples to seeing the circus. Moo! 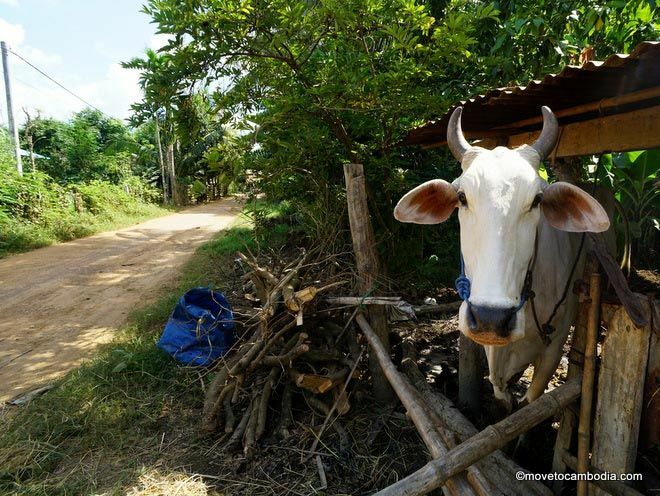 Get out of town and explore the Battambang countryside. If you’re only in Battambang for a day or two, make time for a full or half-day tour of the surrounding area. One of the nicest things about Battambang is the proximity to the countryside, which is known as “Cambodia’s rice bowl.” Tours cost around $15 for a half day and $25 for a full day for up to four people. There are several great tuk tuk guides in town (we’ve got their phone numbers and details here), who can take you through the rice paddies to see rice noodles being made, to a local home where they make rice wine, to a fish market, as well as many of the other attractions listed below. Cambodia’s Phare Circus is based in Battambang, and a visit to the city is a fantastic opportunity to see the show on its home turf. Phare Ponleu Selpak is a local NGO that trains disadvantaged youth in the art of circus, which takes years to master. The circus features acrobatics, gymnastics, and tumbling, for an international-quality show. Regular tickets cost $15 for adults and $8 for kids ages 5-11, and VIP tickets (better, reserved seats) cost $35 and $18 for kids. Kids under 5 can watch the show for free. 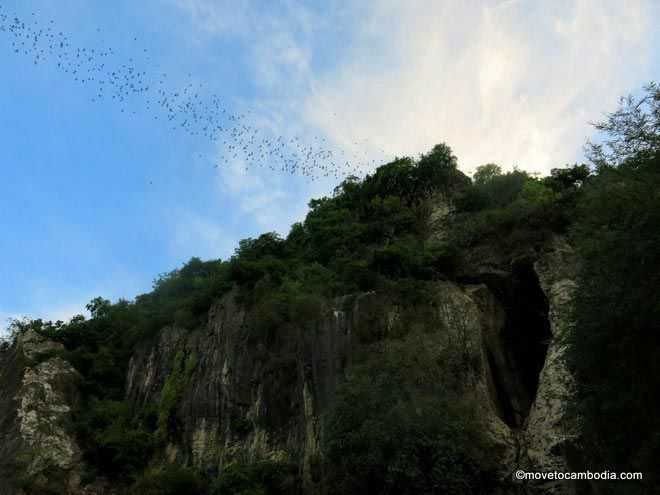 Bat exodus at dusk at Battambang’s Phnom Sampeou. 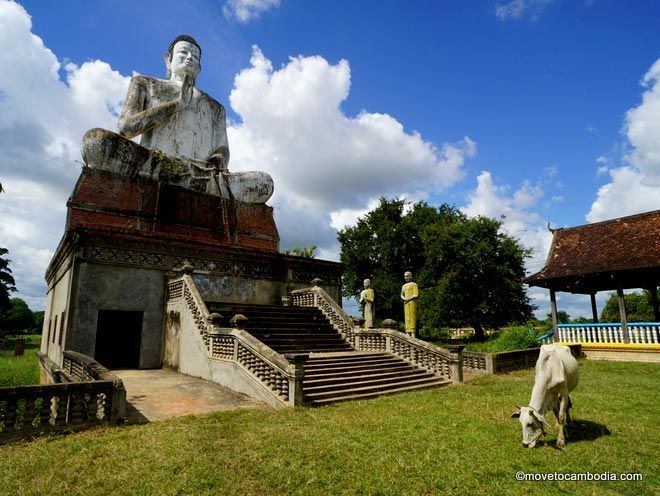 Phnom Sampeou is a mountain with a temple, Wat Sampeou, at the top, from which you can enjoy the best view in all of Battambang of the city and the surrounding countryside. 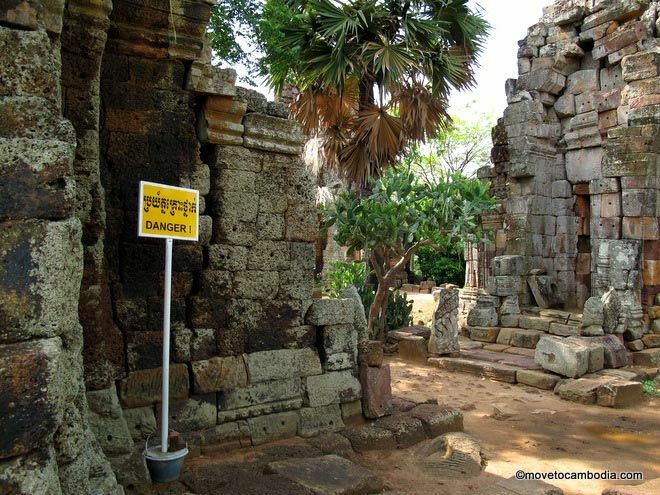 The mountain also features Khmer Rouge killing caves, where Khmer Rouge soldiers apparently murdered their victims by pushing them from a high ledge. Neither the caves nor the pagoda are particularly interesting, and visitors will encounter a fair number of donation requests, but it’s worth going for the view. The over-rated but still fun Bamboo Train. 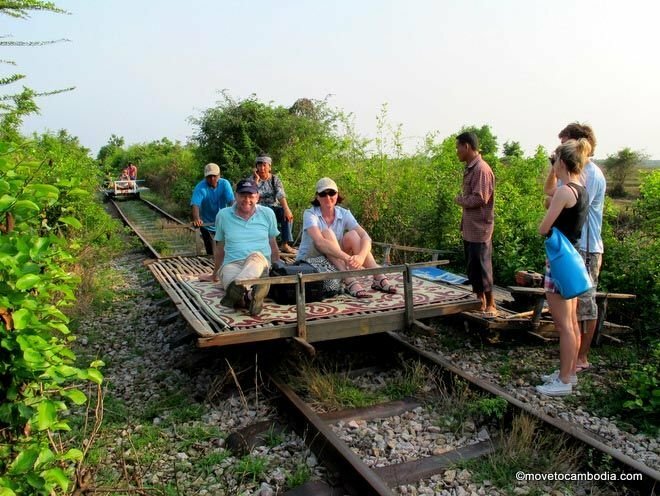 Perhaps Battambang’s most famous tourist attraction, the bamboo trains, or nori, are improvised trains made from bamboo platforms and small motors that run on the disused train lines. Traditionally used by locals to move cargo back when the roads were more difficult to traverse, the bamboo trains are now more often used by tourists. The best part about the bamboo train is when two trains face off on one track and the one with the less heavy load is forced to dismantle and let the other one pass. The price should be $10 for an entire nori which can carry four people, but they will try and charge more (and give kickbacks to your tuk tuk driver). Don’t pay more than $5 per person. While this is considered a “must-do” by some, personally we can take it or leave it. Next to Wat Ek Phnom is a sizable Buddha. Wine aficionados will be politely horrified by the goings-on at Battambang’s Prasat Phnom Banan Winery. The family that owns the place decided to start a winery with no previous experience with viticulture, using imported vines from the US, Australia, and France. They don’t do things strictly by the book and manage to get three harvests a year from their vineyard (a typical winery gets just one). Their red wine is a mix of shiraz, cabernet, brandy, and grape juice. It’s true that there’s nothing particularly noteworthy about the winery, other than the fact it’s the only one in Cambodia, and it’s also true that the wine stinks. But the place is a novelty, the owners are incredibly friendly, and wine tastings are only $2. It’s not worth making a special trip to the place, but it’s an easy stop on many day-long itineraries. Open daily, 8:00 a.m. until 6:00 p.m. 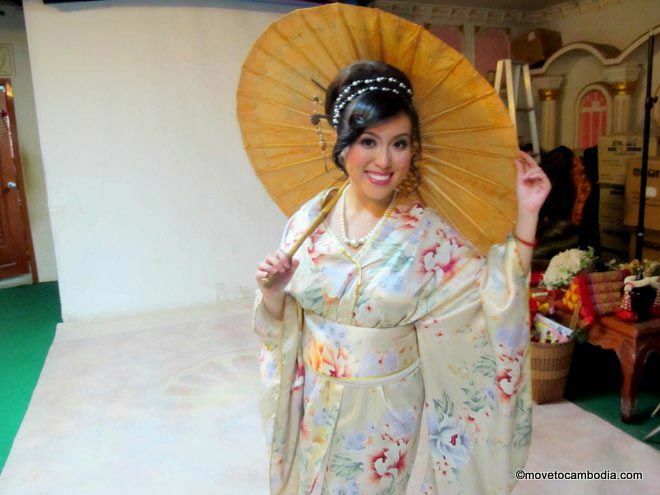 Dress up and strut your stuff and get some studio photos done in Battambang. It’s true that studios offering Cambodian-style studio portraits can be found all over the country, but it’s one of the coolest things to do in Battambang. Traditionally, couples take studio portraits for engagement and wedding announcements. Nowadays, more and more middle-class teens get portraits to post on Facebook. Photo studios have a range of costumes to wear. Most are traditional Khmer garb, but Sangker Photo Studio in Battambang has a particularly impressive array that includes Japanese kimonos and flouncy dresses worthy of a Southern belle. Read our blog post with tips on how to take the best Cambodia studio portraits possible. Open daily, 7:00 a.m. until 7:00 p.m. There are several businesses in town offering bicycle tours. Battambang Bike is a locally owned company that offers a half-day city tour that’s part walking, part boat, and part cycling, allowing for a leisurely trip around town taking in Battambang’s beautiful colonial buildings. 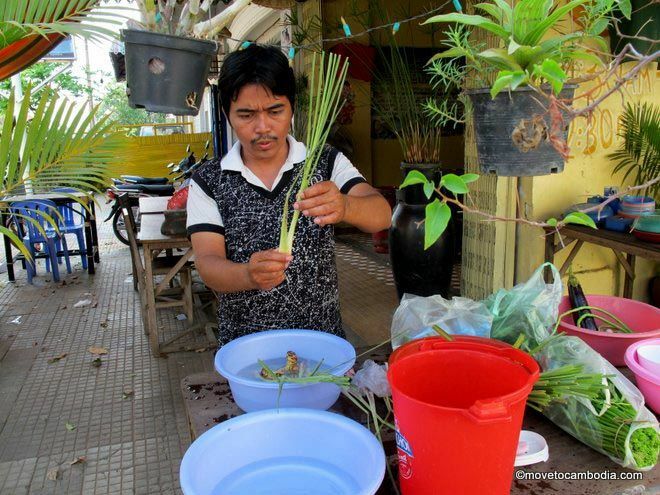 Another half-day outing, the “authentic folk livelihoods tour,” brings visitors to see such local industries as the making of bamboo sticky rice, rice wine, and spring-roll wrappers. Tour prices are around $20 per person and Battambang Bike is happy to custom-design tours as well. Soksabike specializes in sustainable, educational bicycle tours. Their tours are either a half day for $27 or a full day for $40 and take visitors out into Battambang’s beautiful countryside. The tours focus on local industries, such as rice and weaving, and participants can try their hand at making rice paper. Soksabike will be offering multi-day tours in the future, so keep an eye out. Or, if you’re feeling adventurous, you can do it on your own! Read our guide to exploring the Battambang countryside by bicycle. Open daily, 7:30 a.m. to 6:00 p.m.
Open daily, 7:00 a.m. – 7:00 p.m.
For a small town, Battambang has quite a few art galleries. Battambang has a long artistic tradition and historically many of Cambodia’s best artists and performers have come from the region. These days the city is a thriving arts center, with many enthusiastic local artists taking the initiative to put Battambang in the forefront of Cambodia’s arts scene. Galleries seem to come and go regularly, but here’s what’s there now. Several art galleries in town are worth checking out. 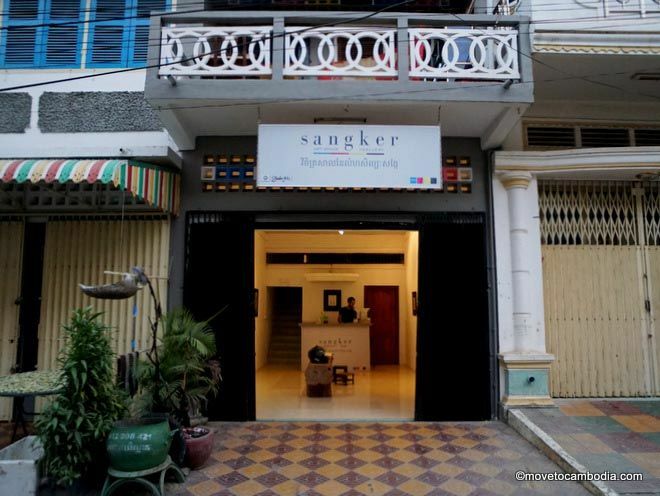 Sangker Art Space and Gallery is Battabang’s newest gallery, exhibiting work by local and foreign artists, with a focus on promoting the work of Cambodian artists. Lotus Bar and Gallery features works by Cambodian and foreign artists based in Battambang. The owner, Darren, is passionate about the subject and will happily give short tours of the featured work. Romcheik Pram Art Space is on the other side of the river and has three floors of contemporary Cambodian art as well as artist studios on site. Also, check out Bric-a-Brac’s guide to Battambang’s art galleries. Open Tuesday to Saturday 11 a.m. to 7 p.m. and Sundays 2 p.m. to 7 p.m. Closed Mondays. Call for out-of-hours appointments. Open Monday to Saturday, 9 a.m. to 11 p.m.
Open daily, 2 to 7 p.m. Learn to cook at the Smokin’ Pot in Battambang. Among the several cooking classes in town, the most famous is the wittily named Smokin’ Pot. The course starts with a market tour and culminates with a lunch consisting of the three dishes taught in the class. Classes cost $10 and each student gets to make three dishes of their choice. All students receive a cookbook from the teacher, Vannak, featuring Khmer and Thai dishes. Vannak is a Battambang native but grew up in a refugee camp on the Thai border and is as adept with Thai dishes as Cambodian ones. Make a reservation at least a day or two in advance, if possible. Visiting during rainy season? 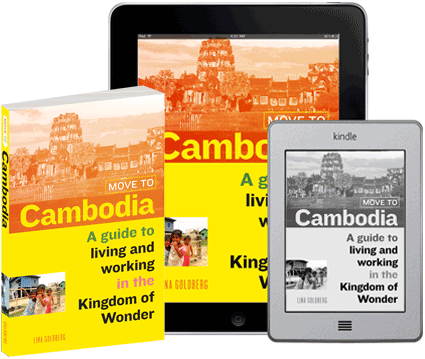 Don’t worry, there are still things to keep you busy in Battambang. We’ve got a guide of what to do in rainy season including pub quizzes, movie nights, board games, yoga classes, massages, and more.